I have been remiss in blogging this month...busy like everyone else! Santa brought me a new laptop so maybe I'll be better at it in 2011. I have been very busy with my Lampwork beads,lots of sales and custom orders. We just got the Hallmark channel for the month and I've been watching Martha Stewart.It inspired my new Etsy Treasury, "Martha Stewart Christmas, Etsy Style". Lisa and I did our last jewelry show of the year yesterday at Harstine Island's Holiday House Bazaar.It was fun as always,but cold! We stopped at the Olympic Bakery on the way home to get some rolls and started looking at all the wonderful cheeses they offer.The owner came out and asked if we would like to sample some.Of course!We sampled some of the best cheeses I've ever eaten with a little wine tasting between.He was very knowledgeable and layed back,no hard sell.It was a very nice ending to our day and our craft show season. Here we are at Olybearzaar at Olympia High, last weekend. Holiday's are my favorite time to think about shopping handmade and making your own gifts as well as decorations,food, and especially Christmas ornaments.I have over 100 ornaments on my tree,many of them handmade by members of my family.A few in particular made by my Aunt Phyllis.She painstakingly pinned tiny sequins on to styrofoam balls in a beautiful pattern.They are some of my favorites.I'm trying to hold on to that tradition by making Lampwork glass ornaments or beads that can be hung on the tree. These Peppermints would make a cute garland. Boy...I better get busy! I feel a change coming on...I for one will be glad when this election is over.I must have recieved 30 phone solicitations from polititions!Now it's time to start thinking about the holidays.I've already started my Christmas shopping,hoping to be too busy making beads in the next few months to worry about shopping.Not to mention the fall and winter shows Lisa (Fanceethat) and I will be doing. Here's some eye candy for your election day Tuesday! After a very successful 3 day trunk show at Bead Artistry in Fresno,I am glad to be home!I caught a little bug while I was gone but am feeling better now.It's amazing what sleeping in your own bed will do!One of the customers from the trunk show purchased an organic style Lampwork focal bead and some coordinating beads from Bead Artistry and came back the next day to show us her creation.Here's a picture of Mary Sue's beautiful necklace!I had a great time at the bead store.It really gets your creative juices flowing! And now it's back to the torch for me,I can't wait!! Getting ready for my Trunk show at Bead Artistry in Fresno! I'm almost packed,all those last minute things to do.Don't think I will get any torch time in today!It's really feeling like Fall now,the colors are really showing.Here's a little frog that decided to park on one of my roses,so cute.Don't you wish sometimes that you had all the worries of a frog? Here it is the end of September already and I haven't blogged since September 9th!I've been very busy getting ready for a Trunk show in Fresno,California.I have lots of beautiful Lampwork beads to take with me as well as toggles, bead cones and glass buttons.We are also celebrating my dad's 93rd birthday! He is so excited to have all the family there.Here's some eye candy in the meantime! I just curated an Etsy Treasury that I hope will make it to the coveted Front Page! After hearing alot of good things about ArtFire.com I decided to open a shop with my handmade Lampwork beads.They make it fairly easy,you can upload your listings directly from your Etsy.It was kinda fun too! They have a color feature where you get to pick the main color in your item. ( I just love color)I have to figure out how to make a banner,I used one from my stash,but I would like it to have my beads on it. This is my latest Treasury I call "Leaves of a Different Color" I love making these Treasuries,which are a collection of handmade items from Etsy shops.Check it out! As promised here is a picture of the new beads I have been making.This glass is a lot of work but the results are worth it! I can't make alot of these beads in one day as the kiln time is very short compared to other beads.So,you have to make them at the end of your session,patience...Now I must get to the torch and start on Christmas beads for my trunk show in Fresno in October. I just attended a customer appreciation party hosted by Franz Art Glass and got some exciting new glass to try.I made some new beads today, so we'll see how they turn out in the morning.It was a very fun weekend,seeing Corina Tettinger again and her adorable Chihuahua,Bonzai.I got to meet the talented Kimberly Affleck and many other glass artists.All in all ...a very fun day! Thanks to Mike Franz and his incredible staff. I am a member of a great community of Lampwork artists.These artists are very supportive of each other in their business as well as personal lives.From time to time they need legal advice.The members have set up an awesome Etsy store called AGLF(Artisans and Glassworkers Legal Fund) with items donated by the members for sale to the public to help raise money for this purpose. I am so thrilled to be on the cover of Bead Trends magazine September 2010 issue! I recieved my jewelry back from the magazine with my free issue and I am on the cover!What an honor. 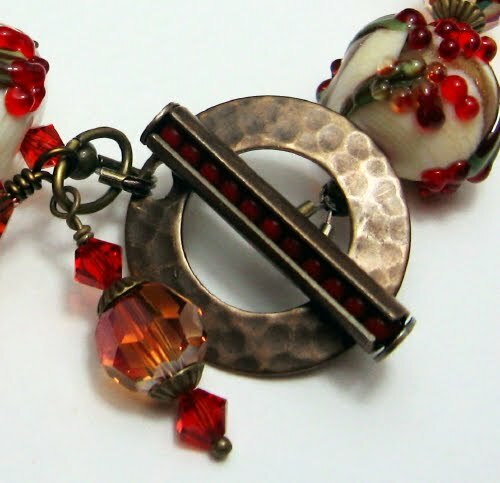 The bracelet featured has my Lampwork beads with antique brass components.Here's a link to the bracelet "Sicilian Nights". My partner,Lisa of http://www.fanceethat.etsy.com and I will be at Lacey Community Market in Huntamer Park (right by Fred Meyers)on Saturday from 10:00 to 4:00. Look foward to seeing some familiar faces and some new ones too!It's supposed to be hot so get out and enjoy the summer,it will be gone before you know it! Sorry, we decided not to do this show due to high winds! This Saturday,July 31 my niece,Lisa ( my partner in crime!) and I will be at our favorite show of the year,Grapeview Water and Art Fair.The view is fantastic,the food is yummy ( we're talking Steamed Clams,Shrimp Cocktails...) and the people are great!This festival is all very nice art and handmade items,not your average craft show.Here's a picture of the view from our booth and some eye candy too! We will also be at Lacey Community Market in Huntamer Park on Saturday, August 14 and Saturday,September 11. My niece Lisa and I just got home from our annual Allyn Days Art Fair.We did pretty good at our show and recieved so many nice compliments on our jewelry.That goes a long way too.It was a little chilly in the morning due to the fog near Puget Sound but it cleared off and was a nice sunny day.Tomorrow...back to the torch! Yesss!! Two new Etsy Treasuries have featured my jewelry and Lampwork Seashell beads.Etsy is such a great marketplace for incredible handmade items.Your dollar goes to so much more than just a purchase,it helps keep these artisans flourishing in doing what they love best.I plan on doing most of my holiday shopping on Etsy. My niece Lisa and I went on our annual buying trip yesterday to the Puget Sound Bead Festival.It was fantastic! So may talented artists and sooo many beads!We had a great time at the Hotel Marano in Tacoma.We had a great lunch and bought lots of new beads to play with.I met some very well known Lampwork artists and got lots of inspiration.So check my Etsy often for new jewelry and beads.Today and tomorrow I'll be at Lady of the Lake Art Fair by Harstine Island selling my jewelry. I made it to the front page of Etsy yesterday and didn't even know it until I checked my stats and had 375 visits in one day! (normal visits is around 50)My freeform peyote necklace was featured in this beautiful Treasury. I have made a very pretty Treasury featuring some very talented Etsy artisans. 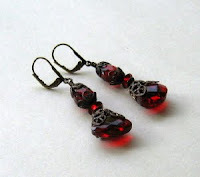 If you have not taken a look at a Treasury,check it out! It's a great way to shop handmade. I'm in love with this glass! All the color in these beads came out of one rod of glass.I encased them in clear and the depth is amazing! I rearranged my studio today,can't wait til tomorrow to make some more new beads.I'll be blogging more often now,it's a great way to stay in touch with my followers. I've been in quite a few Treasuries on Etsy lately.Here's the newest one featuring a bracelet I made with Polymer clay beads that my niece,Lisa made. I am not giving my usual jewelry tip this week,I'm too excited about my new Lampwork Toggles!I have made 2 so far and can't wait to make some more.Any special requests for colors will be appreciated.These Toggle clasps will kick up your designs a notch! Use them in the front of a necklace as a focal or on a chunky bracelet.Have fun! My 92 year old father is visiting from California and we will be taking him to his next destination on Tuesday so I'm writing Tuesday's Tip today! Balance plays an important part of design. Not only physically but visually. Your designs look best when materials are balanced throughout the design.A bracelet with most of the beads on the front of the bracelet will not only look unbalanced but will flip around when wearing it, ending up with all the best beads at the underside of your wrist. If you're not sure about the balance,wear it around for awhile before crimping it!Balance can also be achieved with the clasp,especially on a necklace.If you have a large focal in the front,balance with a large clasp.Make a statement! I have another tip about Toggle clasps.Some of you may have discovered this the hard way,but you want to make sure your bar will fit through the ring when the piece is done.Chunky beads at the end of your design will prevent the bar from going through the ring.If the ring has a small hole or the bar is extra long put a couple of small beads,seed beads or even a short length of chain for a fun look on the end that has the bar.It will then slip through with ease! When using Toggle clasps make sure the bar is not too short for the ring part of the clasp or it will come apart.Also make sure your bracelet or your customers bracelet is not too big. A toggle clasp can come unhooked if the bracelet is too large. Texture is an important part of design.A good example would be the beautiful fiber necklaces,wire work cuff bracelets and carved wooden beads like the ones in this pair of earrings. Sometimes what seems obvious to me might not occur to someone else! I was recently beading with a group of women and I was designing a necklace.I grabbed a piece of paper and started to sketch out my ideas.One of the women said "oh,you draw out your designs first?" A sketchbook is a wonderful design tool.You can make a quick drawing of the piece you are working on,it helps to invision your design.Keep one handy to your beading area and when inspiration strikes make a quick sketch of your ideas.Even if you don't use them right then,you can refer back to your drawings when in a slump! Congratulations Lisa!! My niece Lisa has 3 entries in the Bead Star Magazine finalists.If you haven't voted yet,go to http://www.beadstar.com and you will be able to vote in 9 jewelry design categories.Of course you can vote for whoever you want,but Lisa's are: Crystals,#15, Plastics (her awesome Polymer clay beads)#13 and Stones,#18. There are definately some talented beaders out there.Good luck to everyone! When designing jewelry try to think outside the box! Ask yourself,what would happen if I did this,or changed this,added more or less.Make dangles extra long or turn a component a different way.Think about different color combinations.I like to look at my favorite fabrics for inspiration.By making your jewelry unique it will set you apart from all the everyday beaders and will command a higher price for your unique designs! You can easily make your own earring cards by using a nice cardstock,maybe one that coordinates with your jewelry style.Design the cards on your computer,cut them up using a paper cutter and attach a plastic earring card adapter.You can get them from http://www.riogrande.com and their very inexpensive.I even cut mine into thirds to make them go farther! Use a large needle or small hole punch to make holes and voila!Earrings cards. I make up a bunch at a time so their ready when I go on an earring making spree! I have a page on Fire Mt.Gems website! In 2009 I entered the Fire Mt.Gems annual beading contest.When I heard that I had made the second round of judging I was so excited.I also recieved a form to fill out for their Jewelry Artist profile.If you go to http://www.firemtgems.com and go to the bottom of the home page,on the left hand side under Jewelry Makers Library,click on Jewelry Artists,then Noteable Artists,I'm on the first page! You can read more of my jewelry story there. I really had fun entering this contest and I was thrilled to have tied for 2nd place in the glass category for my Irish Cream necklace. Movement is one design element that I love to incorporate in my jewelry.It can be described as movement of the eye that flows smoothly from one area of composition to another such as gradations of color or form.It can also be literal, such as adding dangles to your bracelet or earrings. The winner of the April Lampwork bead giveaway is Lisa Suver! !Thank you Lisa for all your great tips and your participation in my little contest. The link below will take you to an awesome bracelet that was created by my talented niece,Lisa.She purchased the handmade Lampwork beads from me after our Spring jewelry home party and promptly made the bracelet on Sunday,then listed in her Etsy store!The link will take you to an incredible web site by Rena Klingenberg.If you are not familiar with her,she is awesome!A jewelry designer,business woman,amd entrepeneur who is very helpful to other jewelry designers trying to make it in this oversaturated jewelry market.She has a very helpful website packed full of information for the designer in you! Some designers need help when it comes to an asymetrical or informal balance design. Asymetrical allows objects of varying visual weight to balance one another.In jewelry design this could be a cluster of beads to balance out a large one.Here's an example.You can see how I balanced the 3 strands of beads with the larger beads and Lampwork focal bead on the other side.Please leave your favorite jewelry making tip in the comments section to win a beautiful Lampwork bead made by me! Well,I let another Tuesday slip by without blogging,so here's this weeks tip.When submitting your designs to a magazine or competition (and you should! )always be sure your photos are top-notch.Learn to use the settings on your camera and do some research on jewelry photography on the internet.There's lots of info out there. Leave your favorite jewelry making tip in the comments section to win a beautiful Lampwork bead,handmade my me!Winner announced on Tuesday May 4th. I was recently asked to join the Wall of Flame,Top 100 Lampwork Artists.If I can figure out all the computer stuff and get this going,you can vote for me! The more votes I get the higher my ranking will be.Check it out! Photography is a great way to promote your jewelry as well as keeping records of designs.When someone sees a design that has sold and wants one like it you can refer to the photos of the piece and duplicate it for your customer.It's also great inspiration when in a designing funk! Be sure to leave your tip in the comments section to win this month's handmade Lampwork bead. Today's tip is about jumprings. When using a jumpring to hold a heavier dangle or bead use 2 jumprings as part of the design.Another great way to keep beads from falling off is use oval jumprings as the opening is on the side and is harder for the bead to wiggle out of! Don't forget to leave your favorite jewelry making tip in the comments section,you could be the winner of this months Lampwork bead, a beautiful Teal green focal bead. 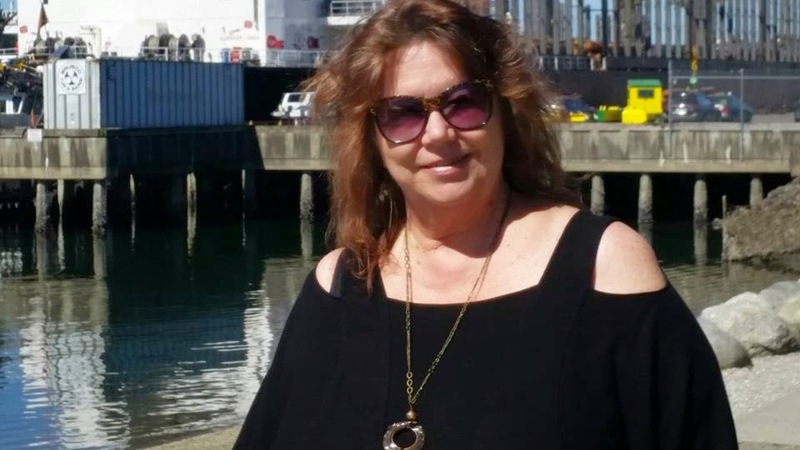 I have recently become aware of a great jewelry designer and business entrepeneur,Rena Klingenberg.She has several websites,books and DVDs. She is very helpful in her efforts to see other women fulfill their dreams as jewelry designers. Her sites include tips on jewelry design,photography,and marketing.Check it out! Congratulations to Lisa who left a great tip about seed beads.She has won a gorgeous Lampwork hollow bead made by moi. Keep up the great tips fellow beadies,you could win this month. Since I love chunky jewelry,this tip came to mind.When making a bracelet with big beads allow for bulk when measuring the bracelet size.It's better to have someone hold the beaded strand around your wrist to check for the size instead of measuring it on a flat surface. Be sure to leave your favorite jewelry making tip to win the beautiful Lampwork bead pictured below.I'll announce this months winner on Thursday,April 1st. I let the days get away from me sometimes...so here's a tip for all you jewelry designers that I am offering from a recent experience.I was all done with my new necklace and went to add up the cost and realized I had left out a 4mm crystal in the design pattern!So... my tip is always double check your design before you crimp the ends!! Be sure to leave your favorite jewelry making tip in the comments section to win the beautiful Lampwork bead pictured below. Art Bead Scene Blog: Monthly Challenge Winners! This is the Art Bead Scene link.They have all kinds of bead challenges every month.It's a lot of fun and will challenge you and therefore improve your beading skills.Check it out! When choosing a color palette for your project,a good way to compare colors is with paint swatches from your local paint dealer.Pick up a few next time you're there,they also come in handy when doing custom orders.You can be sure you and your customer are on the same page when both looking at the colors.They can also be matched to a piece of clothing before bead shopping,just take the swatches with you! March giveaway! Here is the bead I will be giving away to my favorite "Tuesday's Tip" for the month of March.It is a beautiful 20mm pink hollow.A $10.00 value! As promised here is the picture of the necklace that was created at Bead Artistry with one of my Lampwork focal beads.The customer chose the beads and Steph helped her put it together.I think it turned out so cute! 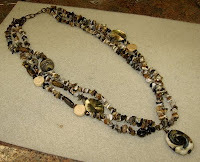 Here's great new site I found with all kinds of beady stuff.Check it out!Beading Arts: Bead & jewelry blogging round-up! When using a large focal bead on a bracelet,a good way to balance the weight of the bead is putting "dangles" on the clasp side of the bracelet.Sometimes I put 3 or 4 dangles. It also adds a fun touch! Don't forget to leave your favorite beading tip in the comments section as I will be having another Lampwork bead giveaway for March. I'm having a great time here in California.The Trunk show at Bead Artistry was a huge success!The next one is in the planning stages.I will post pictures of the show when I return home.I even got to see one of my beads turned in to a necklace while I was there.Penny and Stephanie at Bead Artistry were very nice and helpful as always.If you are in Fresno be sure to visit their wonderful store.Happy beading! As promised, I have chosen 2 winners in the Tip of the Week giveaway. Paula Huckabay and Lisa Suver have tied for the winning entry! I have chosen to give them both a beautiful Lampwork bead first, because they are the only ones who participated and second,because Paula is my sister and Lisa is my niece!Congratulations ladies! Tomorrow I leave for California.Looking foward to seeing family and I would say sunshine but it's about the same temperature down there as it is here in Washington. If you don't have a pair of nylon coated wire wrapping tools,just wrap painters tape(you know,that blue masking tape)around the jaws of your pliers to keep from marring your wire. Today is the last day of our contest for the Lampwork bead.I will anounce the winner(s) on Monday,March 1st. I will be traveling most of the day on March 2nd so there will not be a blog that day.Thanks to those of you who participated in my little contest! Here's a thimble I have started to make with my glass. Let the voting begin!! Beaded Impressions, online bead store contest has closed for the winter edition and the voting begins today and continues to Thursday,Feb.25.I have 3 entries, one in each category.If you would like to vote for me my numbers are:Traditional category,#118, Contemporary category,#8 and Eclectic category,#47.Feel free to vote for the best in each category,it's the voting that counts! Only 2 weeks to go in our beaders tip contest!Don't be left out, you could win this beautiful Lampwork focal bead.It measures 13x28mm. It's all set! The first Stone Designs Trunk Show is set for a preview at Bead Artistry in Fresno,Calif. on Thursday, March 4,2010 and continues through to Saturday,March 6,2010.Lots of eye candy! I have been busy making beads for the last few months for this show and I have some surprises too that are not shown in my Etsy store! Today's tip is about Lampwork bead hole sizes.When purchasing handmade Lampwork beads the artist will usually list a mandrel size(that's the little steel rod used to wind the hot glass onto).If it says 1/16" that's the smaller size,perfect for beading jewelry.If it says 3/32" that's the larger size perfect for beaded accesories like pens,letter openers and bar tool,but can also be used in jewelry,just make sure you fill in the hole(see Tuesday's tip Jan 12)Please make sure you are purchasing Lampwork beads handmade by the artist,not mass produced. WIN,WIN,WIN!! Don't forget to leave your favorite jewelry making tip in the comment section and you could win a beautiful Lampwork focal bead! My class on striking silvered glass was a ball.Sue Stewart is a great teacher and meeting Corina Tettinger and her little Chihuahua,Bonzai was a real treat! Here's a bead I made from the technique. I also just got my jewelry back from Bead trends magazine that was published in the February issue.The necklace sold right away to one of my boutiques and the earrings are listed in my Etsy store. When you reach the point when you decide you want to sell your jewelry,make sure you have a professional finish on your pieces,like crimp covers,wire guards and perfect wire wrapping. I've been making lots of new eye candy! Here's a few photos for you to enjoy. Well,I'm a little late getting Tuesday's tip on,but I had a great day with my niece doing lunch and shopping! I am honored to be in two new treasuries on Etsy. It is all things beachy! When wire wrapping,to make sure your ends are tucked in securely use your outer jaws of your crimping tool to gently press down on the end of the wire.The roundness of the tool is the perfect shape. Here are some Chocolate Lampwork beads I just made and listed on Etsy,just in time for your Valentine creations! I am also included in one called Earth,Wind and Fire. Just to let you know,there is an Etsy store being set up for a relief fund for the victims in Haiti. I will post the name of the shop when they get it set up.All items for sale will be donated by Etsy sellers and procceds will be donated. When using large hole beads in your designs,fill the hole with seed beads,rubber earring backs or hollow rubber tubing available from www.riogrande.com .It will prevent the beads from slipping.Happy beading! Everyone keeps talking about blogging.So,I decided to start my own.I will be posting events in my life that pertain to my jewelry and Lampwork beadmaking career.I'll try to make it interesting and short.I will try to post jewelry making tips and facts from time to time. I have had my jewelry featured in several Bead Trends magazines.I have two projects in the February issue.This magazine can be found at Michaels and Joanne Fabrics.If you use your coupon,it's alot cheaper! I also have a beadwork necklace featured in the Fire Mt.Gems newsletter on January 5,2010.It was my entry in their yearly contest. I started Lampwork bead making in August 2009 and am totally in love with this wonderful art.